It was November of 2001. My mom would regularly bring back art books for me to read from her work building’s library. Captivated by the images on the pages before me, I fell in love with The Starry Night (1889) by Vincent van Gogh (basic, I know). After spending extended periods of time staring into the spiral skies of deep blue and towering cypresses, I knew I had to see it in person. To make my dream a reality, my parents took me to the Museum of Modern Art on West 53rd Street, my first time at a museum. After what seemed like hours of searching and talking to security guards, my parents informed me, to my dismay, that the painting was on loan to the Art Institute of Chicago for a joint van Gogh/Gauguin exhibit called The Studio of the South (September 2001 to January 2002). In an effort to make me feel better, my parents showed me books and prints containing the Starry Night image. We could not leave the museum until I had seen it, whether it be in print form or person as I’d initially hoped. However, the books and print were more expensive than my parents had anticipated, and my dreams were dashed once again. A postcard, perfect. $1.50. 4 x 6 paper. Nothing like schlepping a hefty book home. Same iconic, unmistakeable image. Mission accomplished. In addition to The Starry Night, we purchased postcards of The Sleeping Gypsy by Rousseau (1897) and The Moon and the Earth by Gauguin (1893). Thus began my postcard collection. After my first visit, it became my tradition to buy a postcard every time I went to a museum. It was a small parting gift to remember the works I’d forged a special connection with. I would love it, take it home, and remember it. It started off small, as any collection does. The 2001 MoMA acquisitions instantly became my prized possessions. Wherever I’d go, I would inevitably be accompanied by a ratty plastic bag labeled “Molly’s Postcard Collection” with my miniature paintings in tow. To any person I’d come across, I’d excitedly open the bag, flaunt my cards and proclaim “Look! My art!” Certain people showed interest and struck up conversations, while most (understandably) seemed relatively unenthused by having a young girl shove pieces of paper with art printed on them in their faces. Even though discussing a somewhat limited selection of art with a five-year-old was a niche most people did not want to fill, I continued to seek out people that would be interested. The prospect of sharing my artistic preferences with my peers was beyond exciting. As I got older, the collection grew exponentially. I became a frequent patron at various museums (MoMA, the Met, the Guggenheim, etc.) and would buy any postcard that caught my eye. I’d drag my parents along on my postcard-seeking escapades and they soon became just as invested in them as I was. While I enjoyed their company in the museum, I mainly appreciated their presence because they were both my means for getting to the museum and the sole financial support for my postcard addiction. Due to the amount of time they were spending with me at museums, they became familiar with my taste in paintings, allowing them to help me pick out the perfect postcards to leave the museum with. Before long, three postcards turned into thirty, which eventually turned into three-hundred. When the ratty plastic bag proved to no longer be a sufficient storage method, I graduated to binders. Each postcard now gets placed in its own sheet protector and is organized in a particular way: first alphabetically by the artist’s last name, then chronologically for each artist, then alphabetically by title if a postcard happens to belong to the same artist and same year. This structure is almost as important to me as the actual contents of the collection; it’s an integral aspect of what makes it mine. 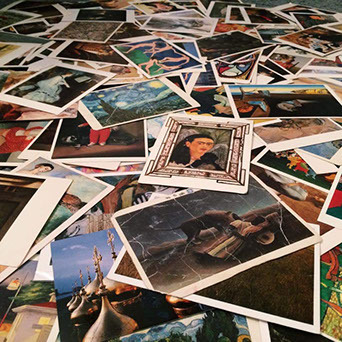 Postcard collections are to art as playlists are to music. Playlists serve as one’s uniquely curated selection of songs, tailored to one’s musical preferences and tastes. In a perfect world, a person making a playlist would orchestrate their very own music festival, one where all their selected artists and songs make an appearance. No one would have an identical festival. My music festival is a museum. My postcard collection is my painting’s playlist. If I were to create a museum, these are the works I’d want to feature, the favorites I’ve made over the years. Playlists are assembled for various moods and scenarios; depending on how the listener is feeling, they can enter a playlist and pick the particular song that caters to their emotions. Similarly, I’d walk through the galleries of my postcard collection and focus on the works that pertain to my mood, which varies from day to day. Some works induce serenity, unease, nostalgia, while others provide answers - or leave leave an abundance of questions. It is my choice which card I look at, just as it is my choice which song I listen to. People send postcards to connect with each other They allow the sender to share a bit of where they are with those they care about and are far away from. The image on the front of the postcard is accompanied by a personalized message, tailored specifically to the receiver. In a sense, I believe the message written on the card is valued more than the front image. The objective of the postcard is not to send a work of art, but to send a letter that happens to be accompanied by a work of art; the painting is not the main focus. The sender could have gone to a museum and blindly picked a card, just to show the receiver that they were at a museum. Perhaps the particular card picked means a lot to the sender, but more often than not, postcards are picked for their immediate aesthetic appeal, not for any additional historical context. In the top left corner of museum postcards, one can find the following information: title, artist, nationality, birth and death years, medium, size, creation date, museum and collection name. When one receives a postcard in the mail, the initial reaction is not to check this information. Instead, one quickly glances at the image and flips to the message they’ve been sent. Essentially, the work of art on a sent postcard holds little value when paired with a written message. When I buy a postcard, my first instinct is to read the informational section on the back. I buy postcards because I care about the facts behind each work and how it relates to the other works I’ve seen over the years. Each painting tells a distinct story. 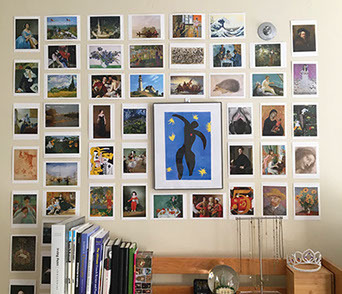 Through compiling postcards, I am able to compare various paintings’ stories and connect them to one another; I better understand shared experiences of artists from similar time periods and learn how the artists of the past influenced future generations of artists and artistic movements. Works from different museums in different states (and even different countries) become intertwined in a narrative my binders and I have made. Instead of sending a postcard to a family member or friend, I feel as if I am sending myself a memory each time I browse my collection. Every card I’ve acquired has a distinct moment of significance attached to it. Over the years, I’ve created a visual journal, a travelogue of sorts, documenting the places I’ve been, the things I’ve seen, the ways my taste in art has changed and they ways my taste in art has stayed the same. It’s November 2017 now, a whole sixteen years after my first museum excursion and postcard purchase. I am currently a sophomore at Boston University majoring in Art History. After I graduate, I would like to become a curator, hopefully at a museum in my hometown (New York City). I am still as invested in them maintaining my postcard collection as I was in my childhood. While every postcard means a great deal to me, none mean more than the postcards that began my collection. I flip through the binder and stop on those three postcards: the van Gogh, the Rousseau, and the Gauguin. I appreciate them in all their beauty: wrinkled and torn, faded and brown with age. I recognize that they’ve gone down this road, the past sixteen years, with me. They transport me back to that November day in 2001. I’m met with the image of a naïve three-year-old girl aimlessly walking through galleries, captivated by the walls of art surrounding her. I remember what it’s like to see a painting for the first time and fall in love. I smile in sweet reflection of that moment so long ago when a great passion of mine was born. They will forever serve as a reminder of the journey they sent me on - they’ll forever be the postcards that started it all.